My sophmore year of college amongst many things included an “independent study” with Jasper Rose, on the work of John Ruskin. The study’s framework consisted of expository essays on subject and citations from select chapters of Ruskin’s autobigraphy, Praeterita. Ruskin is still a monstrance in my psyche, a blood-red stain in all my evening skies. Between The Two Paths, Unto This Last, and Fors Clavigera I never stood a chance. The summary paper was never completed, just could not find the words to connect all the dots. Jasper had at least one other contribution to make to my life, his observation that his other protégé, Kim Cooper, same department—Art History, was my soulmate. Not thinking much of anyone, much less myself at the time, I gave niether the observation nor Ms. Cooper much notice, and kept reading Ruskin. I graduated, and went on to build brick arches and walls, and I thought of Jasper and John. I went on with my life and did many other things, forgetting both Jasper and John. I went on with my life till I ran into Kim about 18 months ago, and could not help but remember. 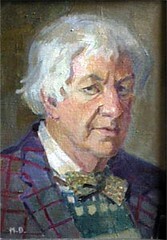 portrait of jasper from maria danishvar‘s gallery.